I like a good centuries-old building. But sometimes these old structures can get a bit dank and gloomy inside. So it’s good to decorate them, with whatever you happen to have at hand — flowers, throw pillows, millions and millions of bones. 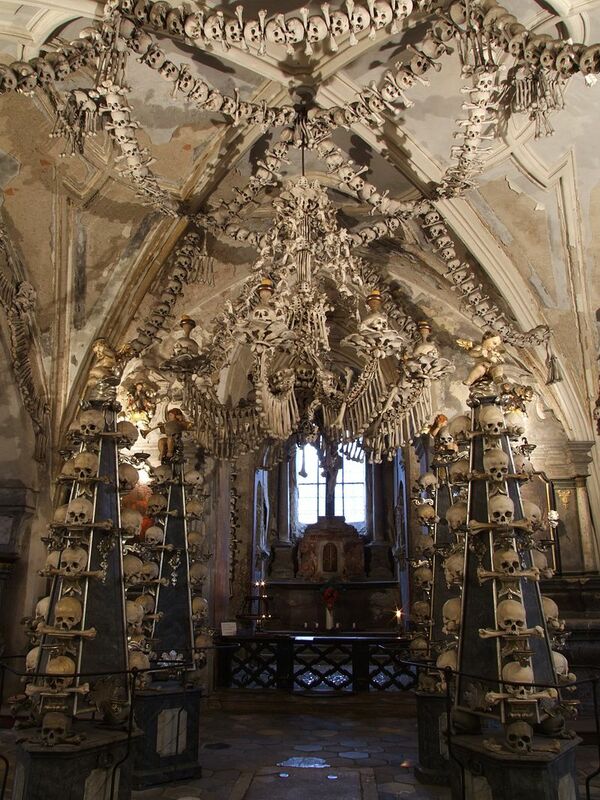 That’s how they do things at the Sedlec Ossuary in the Czech Republic. The ossuary (a final resting place for bones) sits just underneath an old Roman Catholic church and cemetery. Here’s a picture of the decorated interior. The cemetery became a popular site in the 13th century, after a monk from Sedlec was sent to Jerusalem and returned home from the Holy Land with a jarful of its holy soil. This, he scattered across the cemetery grounds. And suddenly everyone wanted to be buried there! According to the ossuary’s website, people travelled to Sedlec when they felt death approaching, so that they could be buried amid a small piece of the Holy Land. As years passed, the cemetery’s popularity grew and soon older graves had to be dug up to make room for the more newly dead. Then, in about 1400, a gothic church was built near the cemetery, and during its construction even more graves were unearthed. That left a lot of bones just lying around. So the basement of the new church became a designated ossuary. A mostly blind monk was given the task of organizing all the bones, but he didn’t do anything particularly creative with them. It wasn’t until a few hundred years and a few hundreds of thousands of bones later that a man, a woodcutter, was hired to better arrange the disordered bones. And this guy, well, he really took to the task! He came up with some striking arrangements. Here, for example, is a coat of arms. 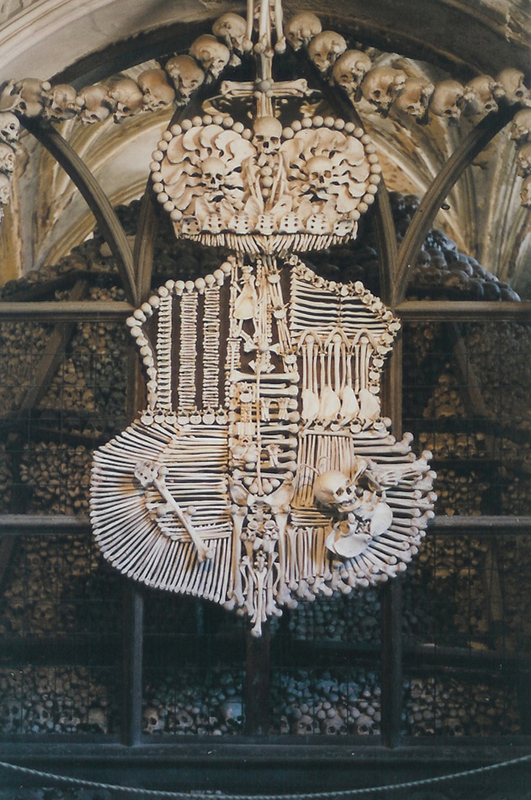 The ossuary’s website has some more good photos of his work, including a bone chandelier that apparently features at least one of every kind of human bone. In fairness, the woodcutter did have a lot to work with. Wikipedia estimates that the ossuary holds something like 40,000 – 70,000 skeletons. This place is now a popular tourist haunt (ha! ), one of the biggest attractions in the Czech Republic. It brings to mind the whole idea of dark tourism or grief tourism, a pretty big industry, which involves visiting places that have been marked by death or tragedy. Chernobyl, Auschwitz, Hiroshima. Prisons, battlefields, dungeons. A good many studies have been done in the field of dark tourism, from a range of perspectives (economic, anthropological, philosophical, etc.). But the most interesting to me is the psychological. What draws us to these places? Do they bring about a necessary reflection over life and death? Do they help us understand and move beyond tragedy? Or is it something less noble? A cheap voyeurism? A giddy thrill? Hard to say, hard to say.